…Even though we are not to be of this world, we do know that we are in this world and the things of this life do require our attention. Just as we are to rejoice always and pray without ceasing, so too are we to continually set the Lord before us. All of these are to be regular daily facets of our lives. We are to be so conscious of God, His presence, and His working that it shapes our view of the world and it becomes second nature to us to turn to God in all things. When we do, the Lord will be the center of attention and our affections, especially in those times when He is to be set before us without distraction. [W]hat times, circumstances, or occasions are necessary for our total attention to be placed upon God? One such time is seen in Psalm 130. In this Psalm the Lord is mentioned in every verse either by name or personal pronoun. The Psalmist is clearly focused upon God without distraction. What has brought him to this? Verse 3 tells us it is his iniquities. The sin of the Psalmist has caused him to sink to the depths and it is from here that he cries out to the Lord and makes his supplication before Him. He knows he is a sinner and confesses it before God, acknowledging that he cannot stand before a holy, righteous, and just God. The sinner acknowledges that if God were to judge him based upon his deeds that he could not bear to stand before God and would be utterly consumed by God’s righteous wrath against his sin. Psalm 130 is one of the most encouraging and compelling Psalms regarding our true estate before God and the perfect redemption that He alone provides. The Psalmist is calling to God out of the depths. Don’t you find that we are more often likely to cry out to God when we are laid low than when everything is great and we seem to be living on the mountain top? Don’t ever be sorry for that, because that is exactly what we should do when surrounded by obstacles that seem to crush us lower and lower. There is no other help available; no one else has the power and love to pull us out from the depths. Why does God do this; is it because we are more worthy than others? No, the Psalmist says that if the Lord should mark iniquities who could stand? That’s a love we know little about; a love that is there even though there is nothing within us that deserves such love. Knowing this, the Psalmist waits for the Lord more than the watchman waits for the morning. The message of the Gospel to everyone is: Hope in the Lord! For with the Lord there is steadfast love, and with Him is plentiful redemption. I will never understand that, but I am so incredibly thankful to God for the complete redemption He provides, and the daily help to get through the circumstances of life. Pray today that you would hope in the Lord and experience His steadfast love and plentiful redemption. Do an image search for Wesleyan Quadrilateral and you’ll find various attempts to explain it. I’m not sure the one on the bottom left is what Wesley had in mind. Capt. Michael Simpson is an officer in The Salvation Army in Cobourg, Ontario, Canada. He wrote this originally for the local newspaper there as part of a rotation where area pastors and church leaders contribute a weekly article. Back in November of 2002 I had the task of writing a paper for my very first theology class in seminary. The title of this paper was simply, God as Redeemer. With the birthing of The Salvation Army in Victorian England and its grounding in the Wesleyan Holiness tradition, it only made sense that I would apply a new-found tool of my critical thought/theological tool box in approaching and writing the paper; the Wesleyan Quadrilateral. This is a methodology for theological reflection that is credited to John Wesley, leader of the Methodist movement in the late 18th Century. In this method, tradition, experience, and reason are employed, while being subject always to scripture, when forming and applying our theology. Each of the “legs” of the Wesleyan Quadrilateral must be taken in balance, and none of the other three apart from scripture should be viewed as being of equal value or authority with scripture. None of these should be taken in isolation without the balancing effect of the others, and always Scripture should have the central place of authority. The purpose of that essay was to look at the redemptive nature of God, specifically the idea of God as redeemer, working through the life, death, and resurrection of Jesus Christ, and what that means for humanity in this present age. First of all, what did the biblical story, and especially its focus on Christ, have to say concerning redemption? Secondly, how has the church throughout its history understood Christ as its redeemer? How is the notion of redemption viewed in our present context, both personally and communally? Lastly, what difference does the idea of redemption make in the personal and corporate life of Salvationists, or all those who identify with the Church. While I will refrain from answering these questions in my remaining words I will put forth a challenge. That challenge is to think critically. Think critically regarding all that goes on around you in these days. When you read a news article or listen to a radio program… think critically. Apply these 4 “lenses”, if you will, in how you view and then respond. What does scripture say? What about tradition? Experience? What does reason have to say? At times I am guilty of allowing myself to get caught up in popular thought without really thinking for myself; without basing my response in truth. Ah, there it is… truth! My dislike of a truth does not make it less truthful. We understood this in grade school… but today… this is why I need to pinch myself sometimes. 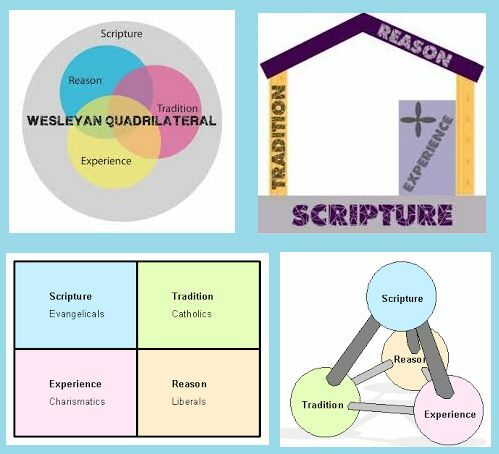 The Wesleyan Quadrilateral, or Methodist Quadrilateral, is a methodology for theological reflection that is credited to John Wesley, leader of the Methodist movement in the late 18th Century. The term itself was coined by 20th century American Methodist scholar Albert C. Outler. This method based its teaching on four sources as the basis of theological and doctrinal development. These four sources are scripture, tradition, reason, and Christian experience. Upon examination of Wesley’s work, Outler theorized that Wesley used four different sources in coming to theological conclusions. Wesley believed, first of all, that the living core of the Christian faith was revealed in “scripture” as the sole foundational source. The centrality of scripture was so important for Wesley that he called himself “a man of one book”. However, doctrine had to be in keeping with Christian orthodox “tradition.” So, tradition became in his view the second aspect of the so-called Quadrilateral. Furthermore, believing, as he did, that faith is more than merely an acknowledgment of ideas, Wesley as a practical theologian, contended that a part of the theological method would involve “experiential” faith. In other words, truth would be vivified in personal experience of Christians (overall, not individually), if it were really truth. And every doctrine must be able to be defended “rationally.” He did not divorce faith from reason. 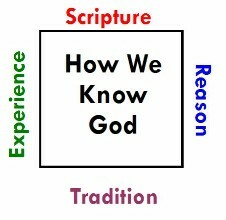 Tradition, experience, and reason, however, are subject always to scripture, which is primary. Each of the “legs” of the Wesleyan Quadrilateral must be taken in balance, and none of the other three apart from scripture should be viewed as being of equal value or authority with scripture. None of these should be taken in isolation without the balancing effect of the others, and always Scripture should have the central place of authority. Further reading: Travel back to 2009 and explore the elements of the quadrilateral as flour, milk and shortening, baking powder and salt. The author contends that like the recipe for baking powder biscuits, the elements are combined in different amounts. 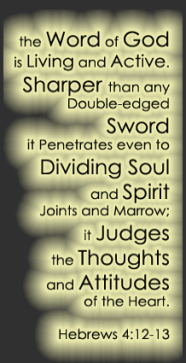 This is one of my favorite Old Testament passages and one which I think is strongly tied to New Testament salvation. We’ve discussed it before here in the context of the idea of an invisible transaction; that there’s nothing tangible or quantifiable that one does at the moment of crossing the line of faith. Today’s thoughts are more directed to the source of our salvation. 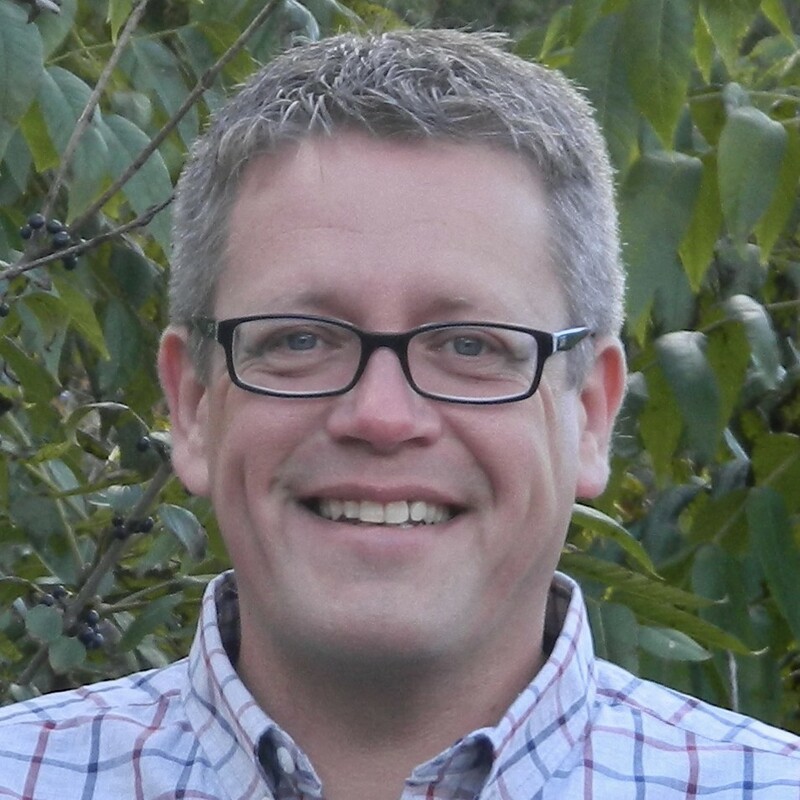 We’re paying a return visit to the blog, Counseling One Another by author and pastor Paul Tautges. Please click the link below and read this at source. The book of Numbers contains the account of a strange event which took place during Israel’s time of wandering in the wilderness. It is most often referred to as Moses and the bronze serpent. Let’s take a few minutes to think about this unusual biblical story, see its significance to Israel, and then learn from Jesus’ interpretation and application in the Gospel of John. First, read the original account. There are four truths God wants us to understand and embrace. 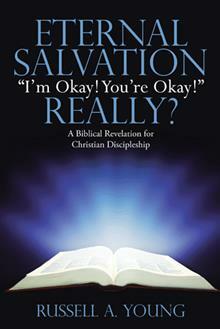 Saving faith realizes the guilt of one’s sin and the justice of God to punish the sinner (Num. 21:7a). Just as personal admission of one’s sickness is a prerequisite to being helped by a physician, personal admission of sin is a prerequisite to receiving forgiveness from God. Before the sinning people could be forgiven they had to admit “we have sinned.” The snake bites brought them to the place of personal conviction and then they were ready to make a plea for forgiveness. One of the two guilty thieves hanging next to Jesus had a similar response. While one thief joined the crowd in launching accusations at Jesus, the other realized his sinfulness—he knew he deserved to die for his sin. So, before he died he looked to Jesus with the look of faith (Luke 23:39-42). As a result, he joined Jesus in Paradise that very same day. When we honestly face our sin and guilt then, and only then, our heart is prepared to confess to God and look to the Savior for mercy. Saving faith recognizes the need for an intercessor between the guilty sinner and God (Num. 21:7b). When the people realized the guilt of their sin they immediately turned to Moses saying, “Pray for us.” Instinctively, every guilty sinner knows he cannot simply waltz into God’s presence on his own. He must have a representative, an intercessor, a mediator. The sacrificial laws and prescribed rituals found in the book of Leviticus made this clear to God’s people. Thankfully, God has provided the one and only perfect priest to intercede for us, to reconcile us back to Himself. 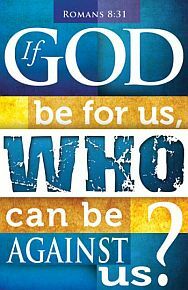 For there is one God, and there is one mediator between God and men, the man Christ Jesus, who gave himself as a ransom for all, which is the testimony given at the proper time (1 Timothy 2:5-6). When we confess our sins to God, while at the same time looking to Jesus, we have an advocate with the Father (1 John 1:8-2:1). Saving faith looks to God alone to provide the necessary remedy (Num. 21:8-9). The bronze serpent could not save the people. Only God could provide the remedy. In looking to the brazen serpent on a pole their eyes of faith looked to God. Sadly, the bronze serpent eventually became an idol that was worshiped during the time of Hezekiah’s reign (2 Kings 18:4). But true saving faith does not look to religion, statues, or human priests. It looks to God as the only one who can rescue us. We are desperate sinners who cannot save ourselves; we must be saved by God’s grace, as the apostle makes clear in Romans 5:6-10. Saving faith looks to Jesus to be the Mediator, propitiation for sin, and the entrance into eternal life (John 3:14-18). In the Gospel of John, Jesus makes it crystal clear that the bronze serpent was a type of Himself. And as Moses lifted up the serpent in the wilderness, so must the Son of Man be lifted up, 15 that whoever believes in him may have eternal life (John 3:14-15). The word “as” indicates that Jesus was making a comparison. As God provided the means whereby the bitten people could be healed through faith, so He has provided the only means by which our souls may find healing and restoration—through faith. When we turn in faith to look to Jesus, as the only one who can intercede for us before a holy God, we are redeemed from sin and receive the gift of eternal life. Saving faith looks to God alone. It does not look to self. It does not look to any goodness in one’s own heart, nor to the works of religion. There is only one way for the soul to find its healing—and that is in its return to God. To be reconciled to God we must first see our sin for what it really is—an offense to God’s holiness. Because our sin is offensive, God must punish it. But thanks be to God that He has already punished His sinless Son in our place. Are you looking to Jesus to save you? I subscribe to the morning devotional Breakfast of Champions by Andy Elmes, which originates from the UK ministry Great Big Life. He recently did a series of four posts, two titled “What Do You Smell Like?” and two titled “Your Smell Affects Others.” The following is an edited version of the second two. But thanks be to God, who always leads us in triumphal procession in Christ and through us spreads everywhere the fragrance of the knowledge of him. For we are to God the aroma of Christ among those who are being saved and those who are perishing. To the one we are the smell of death; to the other, the fragrance of life. And who is equal to such a task? The fragrance that comes from your life affects three people, according to Corinthians. Let’s look at the first of these three this morning. “We are to God the aroma of Christ”. How awesome is that – when God leans over and sniffs us living our everyday lives, He smells the incredible fragrance of the beauty and righteousness of His Son, Jesus. You may say, “But you do not know what I did this week”. My response is that you need to know that, according to God’s word, your life is hidden (positioned in) Christ and when God smells you, He smells the fragrance of Jesus and of His finished perfect work of redemption. And he came near and kissed him; and he smelled the smell of his clothing, and blessed him and said: “Surely, the smell of my son is like the smell of a field which the LORD has blessed”. The smell that is upon your life is the smell of the Son He loves and the field (life of His Son) that He has blessed. How awesome is that! When you approach God you smell like Jesus. Also, you need to know that, unlike Jacob, this is not a con but rather an intention of God, because it is He who positioned you in Christ. Don’t feel like a fraud, like Jacob did, because you’re not. Your scent is the result of His intent and it is He that coated you in the Son of His delight. …Two groups of people are mentioned in the above verses, and two distinctive smells. If we let them follow their natural order I think we may be able to see that God intended both smells to exist and play their part. Corinthians says that we are the smell of death among this group. Death? One way of looking at it could be that our lives should smell of the death we have experienced in Christ. When people (church folk) get to experience our aroma they should smell the scent of the death we have died in Christ on us. It is that divine death that separated us from everything we used to be and so liberating and enabling us to be the brand new creations we now are. They should smell the death of such things as selfishness, pride and other scents that were once common to us and also that there is a new creation smell to us now. Our aroma among the unsaved should be one of extreme life. When unsaved people get a whiff of us they should be overwhelmed by the scent of resurrection and new life that comes from every pore of who we are. Remember that through new birth (death, burial and resurrection) we have been made alive together with Him and so our lives should smell of life, not like the musty corridors of religion. Let’s face it, the smell of life is so much better than the smell of death. Life is more likely to attract followers than that of death. What would you follow? As we move forward to possess our day let us be conscious of the aroma our life is giving out to the world God has called us to change. I subscribe to the morning devotional Breakfast of Champions by Andy Elmes, which originates from the UK ministry Great Big Life. He recently did a series of four posts, two titled “What Do You Smell Like?” and two more titled “Your Smell Affects Others.” The following is an edited version of the first two. A better way of saying ‘smell’ would be to use the word ‘fragrance’, or ‘aroma’. 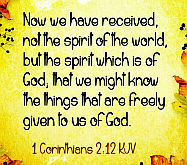 Paul’s challenge to us is this: What aroma or fragrance is coming from our lives as we live them out daily? God’s plan was that our lives would “spread everywhere the fragrance of Him”. Is that what your life smells like today? When people get a whiff of your life do they smell the scent of grace, and the aroma of someone who knows Jesus? This is a good challenge for each of us to consider and, as with many things, there is a natural and a spiritual reality to smells and people. We can compare them both to make a point. All of us have experienced, or been exposed to, at one time or another, a person passing us with a nice scent – maybe an expensive perfume or after shave. It’s also very likely you have experienced the smell of someone passing near to you with bad BO (body odor). Have you ever sat in the same room or enclosed place with someone who removes their shoes and they have really unpleasantly cheesy-smelling feet? Yep, we have all experienced both. Naturally, our lives can release a smell or a fragrance that is either pleasing or not-so-pleasing to the senses of others, and spiritually this is a reality too. What does your Christianity smell of today. Smells are very interesting things. They can attract people or repel them depending on what type of smell they are. When people encounter you do they smell the sweet perfume of knowing Jesus or the odor of religion, with all its various scents of law and legalism – or worse, the pungent stench of hypocrisy? We shouldn’t have to struggle to daily release the sweet scent of Christ from our lives, but simply remember that it is the natural reaction of His life resident within us. Again, look at the natural body as an example. The reality is that whatever is in you, or put into you, can play a large part concerning the odor that comes from you. One of the times that I took Gina out to eat, I ate a very large chunk of garlic without realizing it was raw. By the end of the night it was manifesting its odor nicely from every pore in my skin and, by the next morning, had contaminated every inch of who I was – especially to my family who sadly had to experience my breath. • Jesus now lives in you. You are not a hotel He visits but rather His home (place of residence). He does not pop in and pop out when He feels like it but never leaves according to His promise. Christ in you is the hope of Glory but also so the source of the pleasing fragrance that comes from your life. • You realize and accept that your life is now His home and, as you do, you daily yield and submit everything you are to Him. The fragrance of His life comes from every part or through every pore of who you are. Also, while we talk about the principle of “what goes in affects what comes out”, it is important that you be daily feeding your life the stuff that you want your life to be smelling of. For example, if you keep feeding your life the law of Moses then it will be the law of Moses that you smell of. Feed your life daily the truth and grace that comes through Jesus and you will love the way your life starts smelling, and so will others. Bless you and consider again the One who has now become the very contents of your life. Let His life flow out of you again today. May our lives today release wherever we go that sweet aroma of Christ in us. May that smell attract people to follow Him. Be smelly, in the right way! Did Christ Have to Be Redeemed? Did Christ have to be redeemed? The simple answer to this question is that he did. This might sound absurd since he was God and the Son of God. However, he was also man and the son of man and he had to meet all the requirements of God’s government to accomplish his own eternal life. Why is it important to recognize that Christ needed to be redeemed? The KJV has inserted the words “for us” after “having obtained eternal redemption.” (Heb 9:12) This phrase was not in the original Greek and should not be in the text. Because of it an understanding has developed that a person’s redemption from the law is eternal, that he has been eternally and securely delivered from the righteous requirements of the law. Christ had obtained eternal redemption for himself only. There are teachings that reveal that although a person might have been redeemed once from the law, he or she can make themselves subject to it once more. Paul has written, “But if you are led by the Spirit you are not under the law.” (Gal 5:18 NIV) This is a conditional statement and if a person is not led by the Spirit, he or she will remain under the law. Either a person can accomplish the righteous requirements of the law as led by the Spirit or it remains for them to accomplish their righteousness through the law using their own resources as in the manner of the house of Israel as they lived subject to the Old or first Covenant. Further, the Lord taught that “everyone who sins is a slave to sin. Now a slave has no permanent place in the family, but a son [one led by the Spirit, Rom 8: 14] belongs to it forever.” (Jn 8:35 NIV) A lack of “permanence” in the family speaks against the concept of having been eternally redeemed. Those who have confessed Christ’s lordship have been redeemed by his blood. They have been purchased from the law and from the consequences of sins committed while under it so that they might enjoy the New Covenant. (Heb 9:15) This redemption is not direct. It came about as Christ took their sins and bore them himself. His blood then redeemed him from the sins that he bore for them. The writer of Hebrews states that “if we deliberately keep on sinning after we have received the knowledge of the truth, no sacrifice for sins is left, but only a fearful expectation of judgment and of raging fire that will consume the enemies of God.” (Heb 10: 26─27 NIV) The cleansing and freedom from past sins will only happen once. Redemption for Christ was eternal for those who walk this earth it has been provided once; unfortunately that occasion will not be sufficient for many. Consider: A few days ago we looked at the problem of praying when the words just won’t come. This can be because the problem we are facing is so enormous, or potentially life-changing. It is in times like these that the Holy Spirit takes our unspoken words and groans, and intercedes to God on our behalf. Prayer in difficult times is generally more heart felt than prayer in easy times. The story of the people of Israel is one of bringing their troubles before God and, once the immediate danger had passed, they promptly forgot and rebelled against Him. As a Christian you are unlikely to go into open rebellion against God, but do you remember or forget God’s providence once the danger you have been facing has passed? I love the opening verses of Psalm 107 where it says: ‘Let the redeemed of the LORD tell their story …’ (v2). It speaks to me of the providence of God and how he cares for and loves us, but it also speaks to me about my response to God’s goodness in my life. When God rescues you in your trouble (note: not from your trouble) are you forgetful, or do you want to thank God so much that your can’t stop talking about it? Are you willing to share details of God’s rescue with your close relatives, home group members, the wider church membership? I’m not advocating being so talkative about yourself that you very quickly become a bore. What I am advocating is the willingness to recognize God’s hand in your circumstances and thanking him first and foremost for this. As the psalmist puts it : Give thanks to the LORD, for he is good; his love endures for ever (v1). Having first thanked God, we should then be willing to share with others what God has done for us. Look again at Psalm 107 and some of the words the psalmist uses to speak of God’s providence for his people. He uses words like redeemed, delivered, led, saved, healed and rescued. All these speak so clearly of God’s love. Don’t let the fact that the immediate danger has passed prevent you from thanking God and telling others about his providence in your life. You never know who is going through similar circumstance to yourself, who needs to hear your words of encouragement. 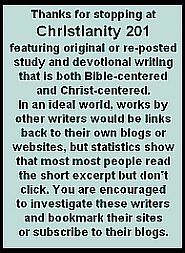 Note: The story in the opening section of this first appeared here at Christianity 201 five years ago. In the little town east of Toronto, Canada where we find ourselves, the local churches come together for a Good Friday service that has grown to the point where it’s now held in the ballroom of a local hotel, and even at that we have to split into multiple service times. I never miss this event. It’s distracting however that we all come together. The “Christian unity” theme tends to interfere. Sometimes, it’s apparently rather difficult for worship leaders to choose pieces that stay tightly focused on the theme of Good Friday, especially when most of our best worship choruses are based on the resurrection we will celebrate on Sunday. God, what are we supposed to be thinking of today? And that’s when it hit me: Sin. We’re supposed to be thinking about our sin. Our propensity to sin. Our sin condition. Our individual sins. The sin that necessitated the cross. Yes, we should think about the price that was paid for our redemption, but we should also think in terms of how we must appear in contrast to a holy God; mindful of our sin nature. For him this was a cause for rejoicing and I certainly sense the triumph and the power of that lyric. But not all callers agreed with him. One woman suggested something to the effect that we need to own our sin. I believe this is the perspective of most Christian writers down through the centuries: We need to remember the pain and suffering that Christ endured because of our trespasses. We recognize that this was the completion of God’s plan; that the crucifixion of Christ is the central element in the incarnation; that this is why Christ came; but we don’t minimize the agony of the cross even if our minds sometimes fast-forward to Resurrection Sunday. It was our sin and guilt that put Him there. And says to Zion, “Your God reigns! 14 How can people have faith in the Lord and ask him to save them, if they have never heard about him? And how can they hear, unless someone tells them? 15 And how can anyone tell them without being sent by the Lord? The Scriptures say it is a beautiful sight to see even the feet of someone coming to preach the good news. So also says a line from the classic worship chorus “Our God Reigns” reproduced in full below. I do recognize however that the full message of the cross is God’s triumph over sin and death. So I couldn’t post the lyrics to Our God Reigns without posting the alternative set of lyrics from Isaiah which are also available. The first verse of both versions is the same. Here is a song that takes us more to the element of celebration that perhaps my radio announcer on Thursday was envisioning. In the end, both elements are part of the big story. NIV 1 John 1:8 If we claim to be without sin, we deceive ourselves and the truth is not in us. 9 If we confess our sins, he is faithful and just and will forgive us our sins and purify us from all unrighteousness. Two days ago we ran a devotional post centered on the phrase ‘sin boldly’ which is a modernization of words spoken by Martin Luther. You can read that post at this link, along with Luther’s original quotation. I realize that we only scratched the surface on this, and sensed through one posted comment and an email that a few of you would like to delve into this a little deeper. So today we’ll take some extra time to hear from several voices. …Although there are a great many references to the need to walk in the light and under the leadership of the Spirit, these are being ignored as spiritual educators hang onto the teachings of Martin Luther, John Calvin, etc. and set the Word aside. …Replacing the word “sin” with the word “murder” we have this: Be a murderer and murder boldly, but believe and rejoice in Christ even more boldly. Or how about this: Be an adulterer and commit adultery boldly, but believe and rejoice in Christ even more boldly. Or perhaps your favorite sin is lying: Be a liar and lie boldly, but believe and rejoice in Christ even more boldly. Do you steal? Be a thief and steal boldly! Just make sure you believe and rejoice in Christ more boldly! Some may accuse me of taking Martin Luther’s words out of context, but I assert that his words have been used as a license to sin by many, and indeed seem custom-made for the job! He said you can murder a thousand times a day and still remain in Jesus Christ! Have you ever heard such blasphemy? I know Luther is a revered reformer, but Christ’s sheep hear His voice and they follow Him. They will not follow the voice of the stranger, and this is the voice of a stranger if I’ve ever heard one. Test the spirits by which men speak! Never assume that someone honored by others is the friend of your soul. To the man whom He had healed from a 38-year infirmity, Jesus said, “Sin no more lest a worse thing come upon you.” (John 5:14) What could be worse than 38 years of perpetual infirmity? Peter wrote of false teachers who would deny the Lord who bought them, bringing on themselves swift destruction. How do they deny the Lord?–through disobedience and teaching disobedience to the Lord’s servants. For they profess to know God, but in works they deny Him. Some of their distinguishing marks are: they will receive the wages of unrighteousness (because they are unrighteous), they count it pleasure to carouse in the daytime (not even blushing for their sins, but doing them boldly even in the company of the Christian church), and they have eyes full of adultery, and they cannot cease from sin (2 Pet. 2:1-14; Titus 1:16). Taken as the premise [for our doctrine of grace], pecca fortiter [sin boldly] acquires the character of an ethical principle, a principle of grace to which the principle of pecca fortiter must correspond. That means the justification of sin, and it turns Luther’s formula into its very opposite. For Luther “sin boldly” could only be his very last refuge, the consolation for one whose attempts to follow Christ had taught him that he can never become sinless, who in his fear of sin despairs of the grace of God. As Luther saw it, “sin boldly” did not happen to be a fundamental acknowledgement of his disobedient life; it was the gospel of the grace of God before which we are always and in every circumstance sinners. Yet that grace seeks us and justifies us, sinners though we are. Take courage and confess your sin, says Luther, do not try to run away from it, but believe more boldly still. You are a sinner, so be a sinner, and don’t try to become what you are not. Yes, and become a sinner again and again every day, and be bold about it. But to whom can such words be addressed, except to those who from the bottom of their hearts make a daily renunciation of sin and of every barrier which hinders them from following Christ, but who nevertheless are troubled by their daily faithlessness and sin? Who can hear these words without endangering his faith but he who hears their consolation as a renewed summons to follow Christ? Interpreted in this way, these words of Luther become a testimony to the costliness of grace, the only genuine kind of grace there is. …First, it is an indictment of who we are. Luther is clearly saying to Melanchthon that we (people) are sinners and because of our fallenness, we will continue to sin until the second coming. I believe that Luther is using a hyperbole here in order for us to understand exactly who we are. Our sins are real; they are not unimportant nor minimal…they do matter. Luther is trying to tell those people who think they are pretty good, except for those little sins here or there, that they are in fact really big sinners and should see themselves as big sinners. Hence why he says, “be a sinner.” What I hear in this is an admonition for me to own the state I am in now and a recognition that I am not a saint on my own. Nowhere in here do I hear Luther giving permission to sin–which is the way I hear the quote often used. Lastly, what is missed in not quoting the whole phrase Luther uses is the admonition to let our trust in Christ be stronger than the sins we commit. Luther is telling Melanchthon (and us) that our trust in Christ is of first importance. It is to be stronger than our sin, and it is to cause us to rejoice in victory. This is important because I often I hear a defeatism in Lutheranism that keeps continually reminding people that we are sinners (which we are), but doesn’t in the same breath remind us that we are in fact freed from sin in Christ whom overcame. I want to thank Deb for getting us thinking about this two days ago and getting us started on the path where we’ve ended up today. She concluded that we can’t be “avoiding life and people to protect ourselves from sin.” In the real world we’re going to get our hands and feet dirty. We need to acknowledge that, which is a very nuanced difference from accepting that.